At the EMMQG we are joining in with the initiative in the quilting community to make quilts for Siblings Together, a very worthwhile cause. A couple of years ago I made some Skill Builder blocks for the QAL ran by Pile O'Fabric. My 8 blocks had become orphans so when we had a day of making quilts for ST at a Quilt Group meeting, I took them along. Hannah embroidered a central block so that we would have 9 blocks, Tanya sewed them together and Hannah quilted and bound the quilt. A real group effort! This will be sent off to Siblings Together and is part of the initiative to make 100 quilts by July (not me! Anyone and everyone who's willing to give up time and stash to make a quilt. You can find out more in the Flickr group). Indeed, a great team effort! What a lovely way to make a quilt top! The colors you used are beautiful together and I'm sure this will make someone very happy! 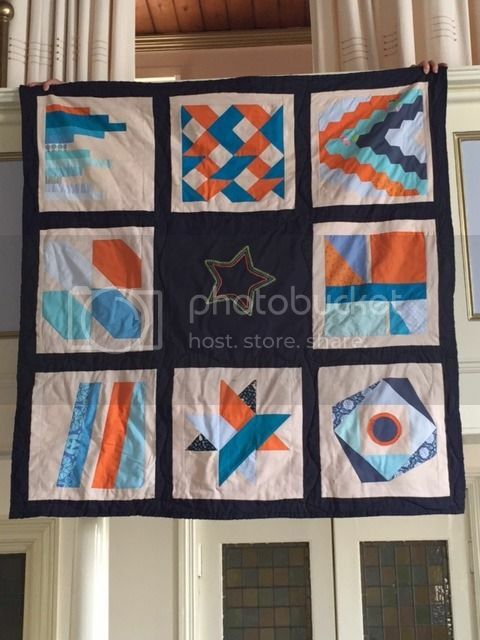 Lovely colour combination, I like that it is a sampler quilt but the asymmetrical and non-traditional blocks give it a unique look. I'm sure the recipient will love it. What a great use of your orphan blocks Wendy, and a lovely collaborative effort from your quilt group. What a fabulous group effort and for a wonderful cause. Great job! What a great way to usefully use those orphan blocks, someone will love that quilt. It is always great to see orphan blocks getting a good use. The end result is quite attractive. YAY for using up orphan blocks (I recently used up 2 myself - they were years old!) and yay for group efforts - lovely quilt! What a great little quilt! And now those orphan blocks will keep a child warm. Collaborations like this are such fun to see!